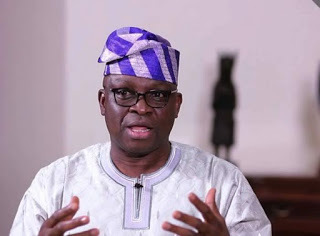 Ekiti state governor, Ayodele Fayose has reacted to former President Olusegun Obasanjo’s statement advising President Muhammadu Buhari not to contest the 2019 election. Fayose said the former president contributed to failure of Buhari’s government. He stressed that Obasanjo has outlived his usefulness in Nigeria and should leave the scene. “I agree with Obasanjo’s letter even though he didn’t say anything that I have not said about Buhari and his government. “However, Obasanjo and Buhari are like the accuser & the accused; two of them are analogue and they do not represent the Nigeria of today. “Obasanjo (the accuser) and Buhari (the accused) are both expired people that Nigerians are desirous of getting rid of. “They both don’t know when they were born and have outlived their usefulness in the political life of Nigeria. “Content of OBJ’s letter is a welcome development but the messenger is also culpable in the enthronement and colossal failure of Buhari. “Though we warned them ahead of this tragedy. It is therefore the decision of Nigerians that Buhari has failed and he must go, not that of OBJ,” Fayose tweeted.